Careful design and meticulous craftsmanship are at the root of most truly exceptional homes, as the designer’s singular vision is encapsulated in a breathtaking unity of theme, where each element enhances and reinforces the appeal of all the others. The amazing architecture of the Homes of Distinction displayed below testifies to the talents of their creators. 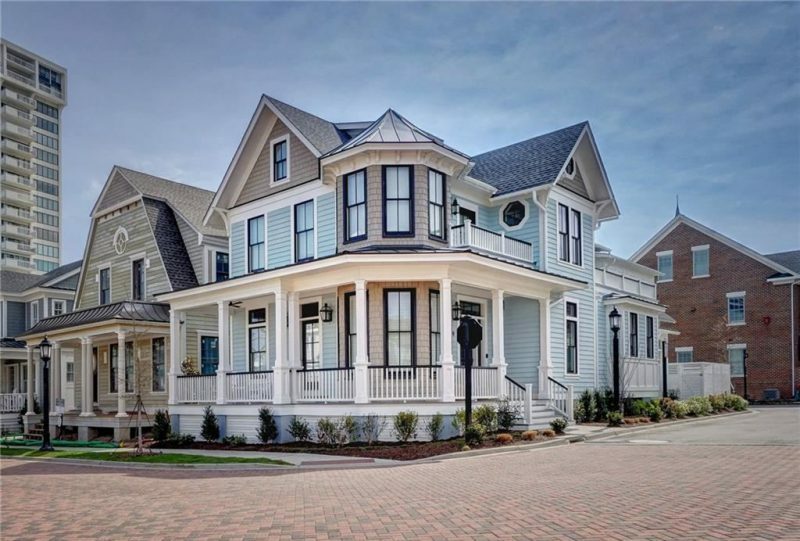 Offering a cohesive combination of traditional features and modern coastal charm, this stylish Victorian home displays professional design, contemporary lighting, and built-in amenities. Enjoy views of the water while you savor cool ocean breezes on the porch, balcony, and patio, or take advantage of a five-star amenity package at the historic Cavalier Hotel. A custom alderwood kitchen, a two-story fieldstone fireplace, and an exquisite library with tiger maple paneling are among the highlights of this extraordinary estate perched atop five-and-a-half acres with views of Buffalo Creek. Walls of windows overlook the grounds, also home to a covered patio with a fireplace, a hot tub, and a pool with a pool house. A stunning wrought iron staircase welcomes you to the magnificent entry hall of this home, tucked away in a gated community. Alabaster lighting, Pella architectural windows, and mahogany, tumbled marble, and travertine floors are on display throughout the interior, and a stone-and-brick terrace with a built-in barbecue is ideal for relaxation. Sixteen private acres overlooking Cazenovia Creek set the stage for this architecturally designed, all-cedar residence with four-season views of meadows, water, and woods. Relax in front of log-burning fireplaces in the living room and library, and then head outside to flagstone terraces overlooking the grounds. Featuring sleek and unique Euro Modern custom design, this smart home with tablet and voice control is a modern masterpiece. High-end German cabinetry complements the kitchen’s Bosch and Thermador appliances, and a custom-designed three-story Finelli staircase with white oak block stairs and hand-finished metal railings is the perfect unity of form and function. You can enjoy one-level living at this stunning, craftsman-style home in Sea Crest Village with 150 feet of ocean frontage and maintenance-free Trex decking that surrounds a heated pool. Sweeping views of the water are visible from the living room, all five bedroom suites, and a kitchen equipped with a walk-in pantry and a wine cooler. Hardwood floors, high ceilings, and four fireplaces are on display at this custom-built home on ten acres in Hunting Valley, which are nestled amid approximately forty acres of preserved land. You can prepare the perfect feast in a gourmet kitchen with state-of-the-art appliances or head outside to a flagstone patio overlooking perennial gardens. Custom, high-end upgrades and spectacular views contribute to the appeal of this stunning home with 80 feet of frontage on Lake Shannon, including a beach and a dock. The vaulted master suite incorporates two walk-in closets, a heated bathroom floor, and a two-headed rain shower, and the rustic lower level connects to a deck and patio with a hot tub and a pergola. This Tuscan-inspired home on 1.2 acres along Lake Medina offers more than 7,000 square feet of exquisite living space. Highlights include a dramatic great room displaying custom woodwork, hickory floors, and a stone fireplace, and a gourmet kitchen fitted with a granite-topped island, dual prep sinks, a wet bar, and high-end appliances. Tucked away amid more than four private acres, this Colonial Revival home dating back to 1825 would be equally well-suited for use as a residence, a bed and breakfast, or an event venue. Restorations and additions complement its period style, and the surrounding property also holds a separate barn with a kitchenette and a bath, as well as an in-ground pool with a pool house. For more information on architectural styles, you can visit the House Styles section of our Real Estate Glossary, and for other examples of architectural masterpieces in your area, you can download a digital copy of our Homes of Distinction magazine. What a beautiful selection of homes!! Thank you for sharing this fantastic architecture!